Description: Kevin Lomax is the most successful lawyer in his hometown in Florida, when he gets a job offer in a prestigious New York based law firm everything seems to be going his way, except for a boss that might have a very different agenda from what he first let on. At first glance, this movie seems like it will be pretty predictable. 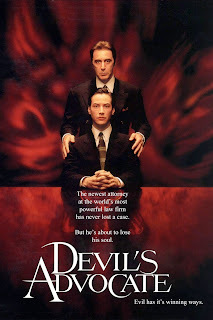 Keanu Reeves plays a young ambitious up and comer lawyer that puts aside his morals to do whatever it takes to win his cases. He's then hired by a major law firm and given the opportunity of a lifetime in the city of New York. Very simple crime thriller-like storyline with a star-studded cast. However, the movie is actually pretty well executed as the young Mr. Lombax loses his ability to keep up with both personal and work related matters as the high pressure makes the world crash around him slowly. Around the half-way point, the movie suddenly changes. Strange things are starting to happen and our main characters mentor and boss seems to be very different than he first let on. That could have been a good enough movie on itself, and I certainly would've enjoyed the movie much more had it not been for the climax of the movie. A film that has till now seemed like a very by-the-book crime thriller suddenly turns into something VERY different. Had this been more clear earlier in the movie, I probably would've accepted it but this turn of events just feels so over the top and out of nowhere that I just couldn't suspend my disbelief any longer when it was time for the big reveal. On the acting side, it is very hit and miss. While Al Pacino phones it in as Mr. Milton, Keanu Reeves tries his best to be taken seriously with a fake southern accents. Overall, the acting from the minor characters is a lot better but unfortunately not present for for most of the film as the main focus of the movie is conversations between Reeves and Pacino. Charlize Theron tries her best in the movie, but it is obvious she was cast for her looks and not her acting ability. 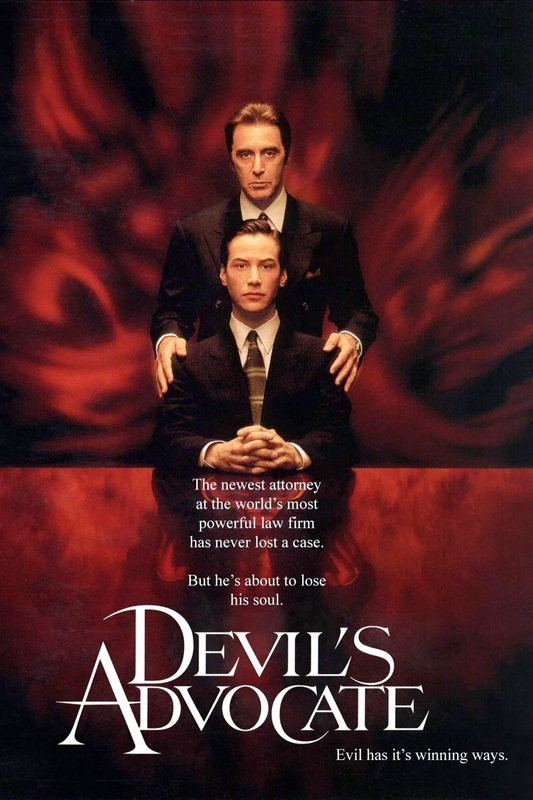 The Devil's Advocate turned out to be a movie with a pretty decent setup that unfortunately just fell flat, what could have been a very good crime thriller about big business and career pressure went down a road where a combination of so-so effects (even by the standards of the era it was made) and poorly argued soapbox ranting that goes nowhere. There is some very well-shot things in the movie, the look of the sets are pretty well thought out and the references to the city of Babylon fit the themes of the movie. But these are unfortunately not enough to make up for some frankly poorly written dialogue and lack of proper consequence for the characters of the movie. The message of the movie is also vague at best, mostly because of the aforementioned soapbox ranting.